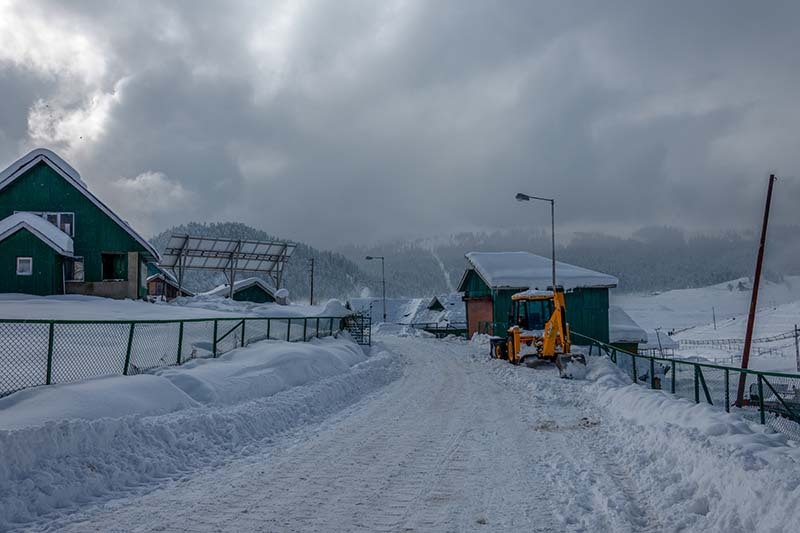 This post is in continuation with a previous one and a part of my Gulmarg Travelogue. 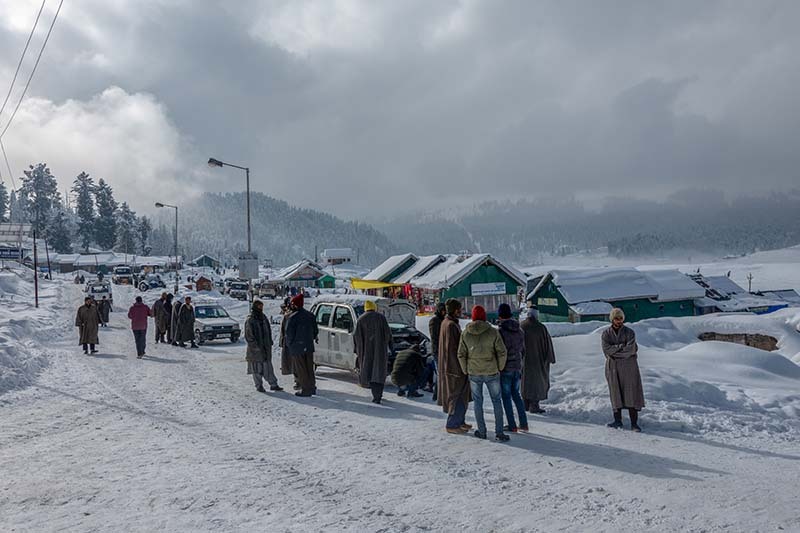 On Day 1, We caught a flight from Delhi to Srinagar in early morning hours and then booked a cab straight from the airport to arrive in Gulmarg by noon. 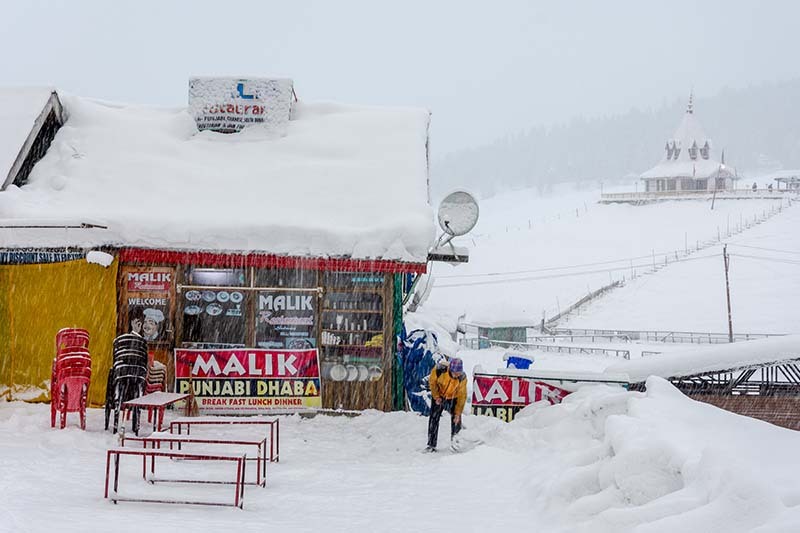 Our Day 2 was spent enjoying a snow covered Gulmarg in January and visiting some of the local tourist attractions. 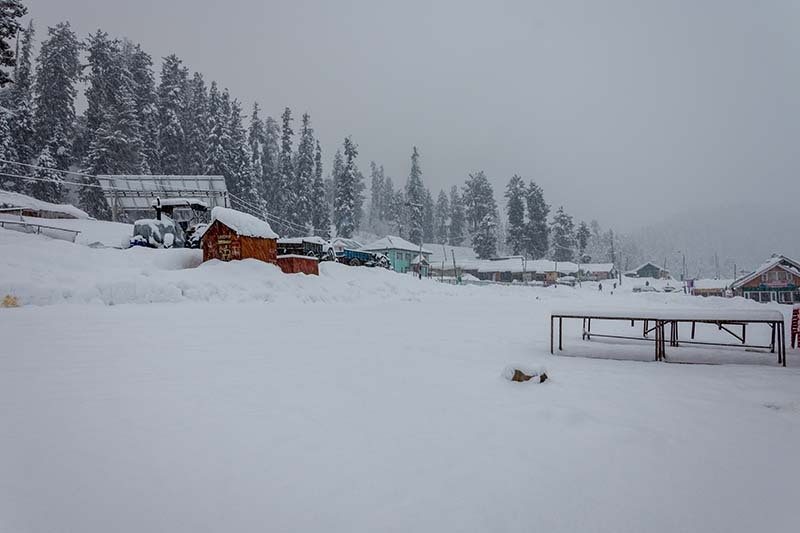 Our third day was spent witnessing a heavy and non-stop snowfall in Gulmarg all day long; which got me wondered if we will be able to leave there the next day as planned. Details of the third day of the trip are mentioned below in the article. To read the previous part of the travelogue, please click on the link below. 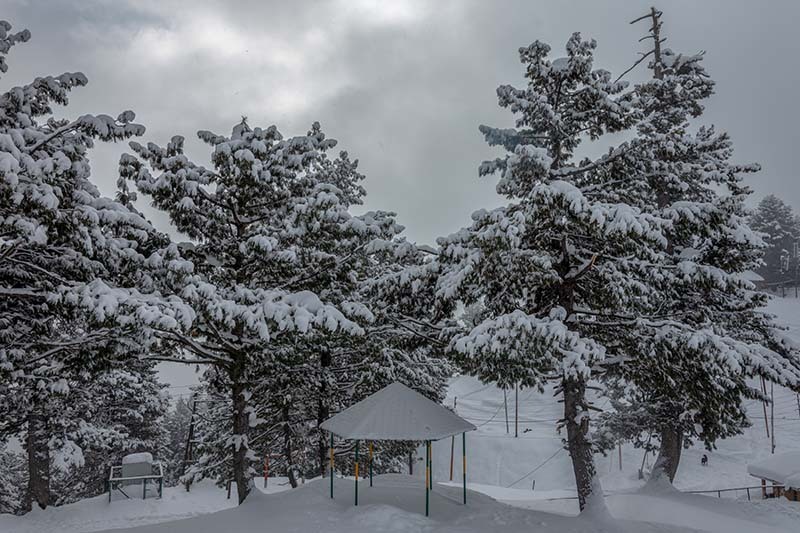 It continued to snow all night long and the temperature dropped drastically. I woke up a few times in between and could hear the high speed winds outside. To some extent, it was even a little bit scary. There were three heaters working in the room all night; and even then, we had to cover ourselves with three blankets. There was one large heater installed in a corner of the room. Second one was a small blower kind of deal that threw hot air when plugged into the socket. Third and the most helpful one was installed in the bed itself. That’s correct, you read it right. This heater would warm up the mattresses and probably was the most helpful one of the three. After a cold but comfortable night, I was again the first one to wake up in the morning. Once again, the same routine followed like yesterday. I called the hotel kitchen and they told me there won’t be anything available until 8 AM. So I packed and wrapped myself well; and stepped out of the hotel to have a cup of tea at Sohail’s restaurant. It was still snowing out there and this was morning was an even colder one than yesterday. 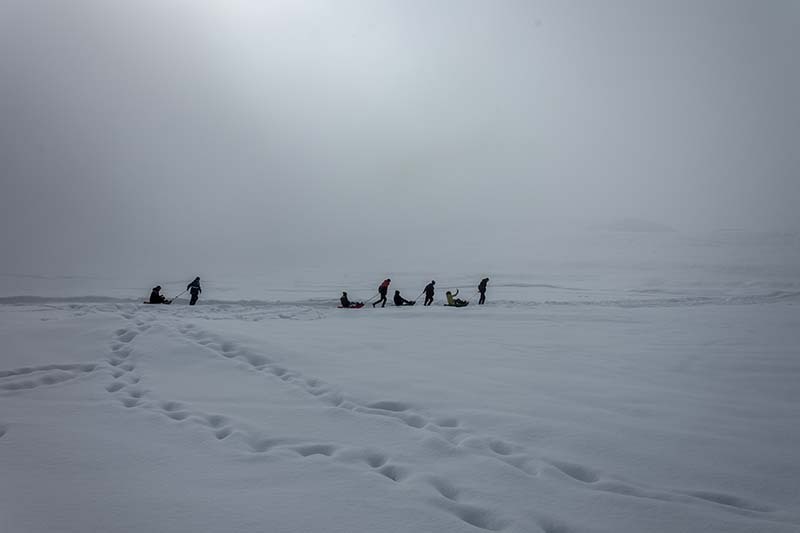 Everything was covered under a fresh sheet of snow and at some places, I had to navigate my way through knee deep snow. 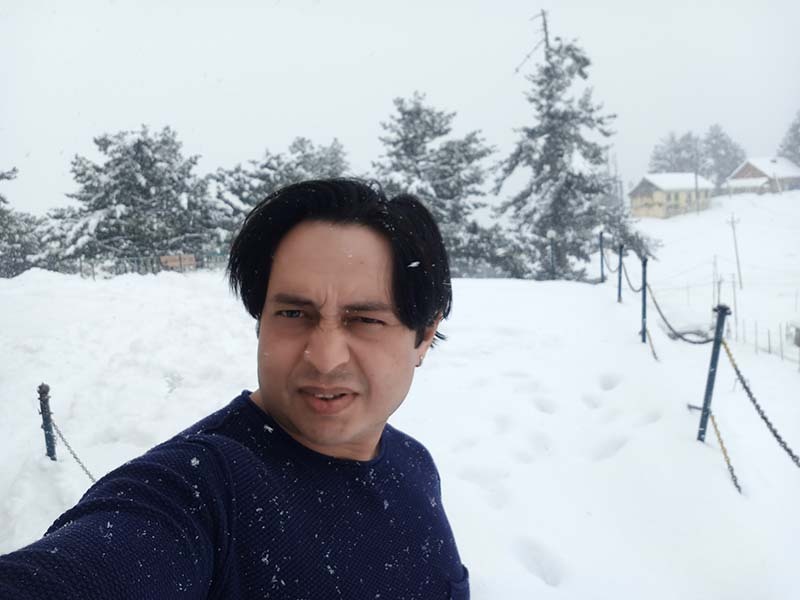 Treading carefully, I finally reached Sohail’s restaurant to find him clearing snow from almost everything. I had a cup of tea and sat in the restaurant for a while chatting with Sohail. 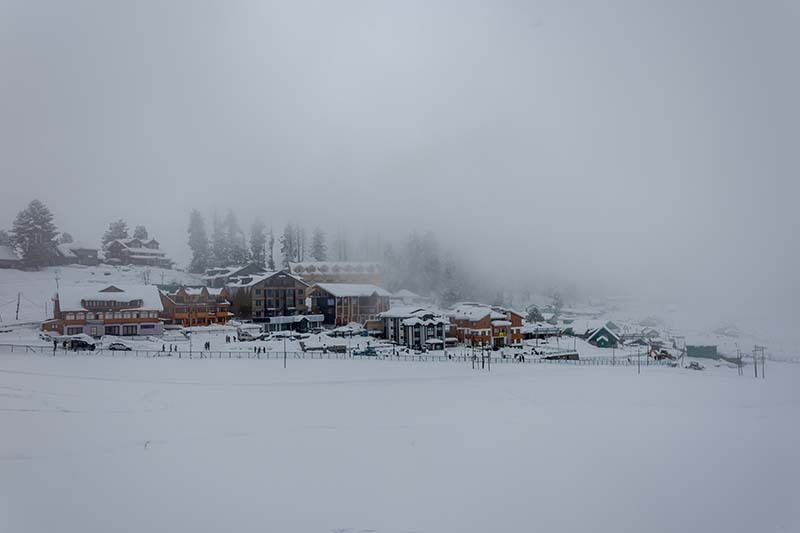 My plan for today was to go for a Gondola ride; but seeing how the weather turned overnight, I wasn’t sure if the Gondola was even going to remain operational today. I asked Sohail and he advised me against going for the ride. Not because it was dangerous or anything but would be a waste of money in his opinion; and he had a good logic to it. The weather was really bad and it was foggy all around. Riding the Gondola in this weather would have meant to just sit in a glass cabin and go up and down for Rs. 1600 per person; without being able to see anything. 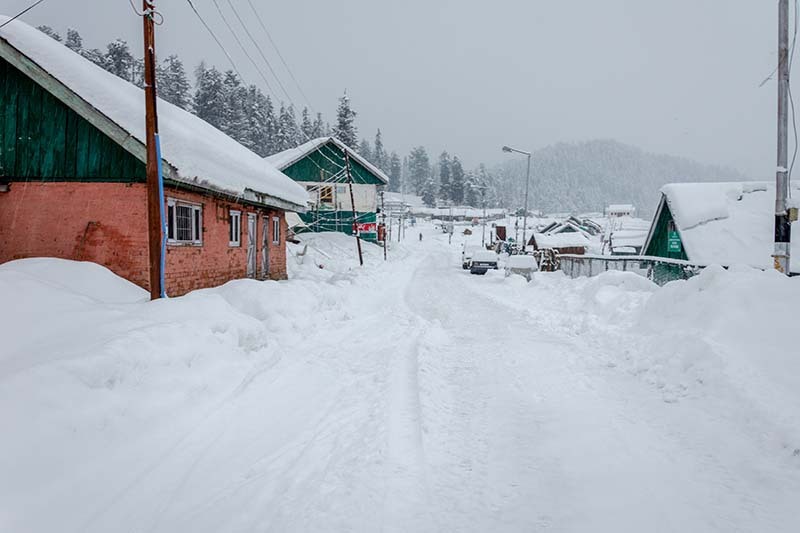 Second logic that Sohail gave was that we were just going to find snow up there; which was down in Gulmarg as well in plenty. If we went for the Gondola ride, then we would just ride up to the station and come back down. We surely won’t be able to step out and explore because everything was under several feet of snow. There was no way of knowing where I may step which made it a bit dangerous as well. So I agreed with Sohail and gave up the idea of Gondola ride; which made me wonder what we were going to do all day today in this weather. The biggest mistake I made was that I did not notify anyone in Hotel Affarwat that we were going to extend our stay by a day. After chatting with Sohail, I came back to our hotel and woke up my cousin. The manager at the reception casually asked me where I was headed today and I told him nowhere. To this he replied that they were under the assumption that I would check out today and had taken other bookings; which meant that I would have to check out of Hotel Affarwat. This kind of disappointed me a lot and I asked the manager to manage my stay somehow. They were however completely occupied for the day and could not accommodate me. He however did not let this become a trouble for me and asked me to shift to another hotel nearby by the name of Hotel Royal Park. But before I did that, I stepped out myself and checked out a few other hotels myself. 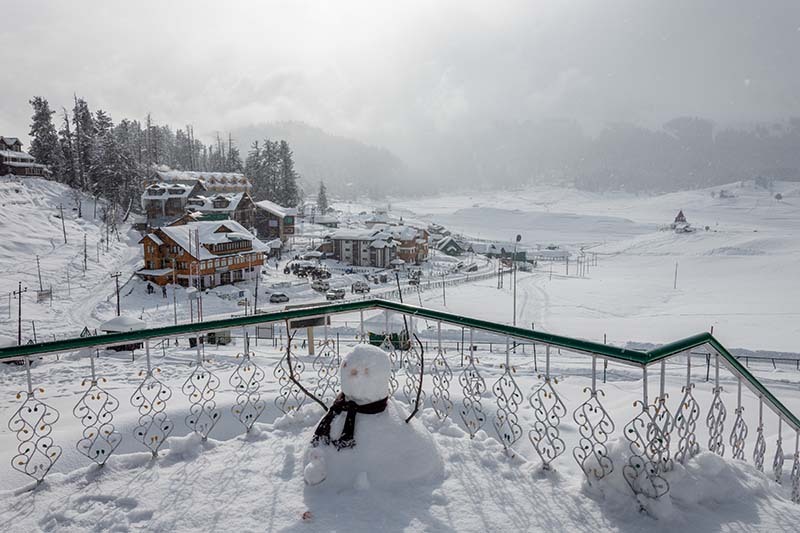 Mountain View, Gulmarg Inn and Welcome Hotel were the three I checked at but did not like either of them. Finally I went and checked the rooms at Royal Park and it looked good enough. The manager at Hotel Affarwat made a call to the manager at Royal Park; and I got the room for the same price that I would have paid at Affarwat. He also had a couple of his men bring our luggage so all that we had to do was walk a few hundred meters and go into another room. I really liked this about the guys at Hotel Affarwat. Even though they could not extend my stay, they still got me another good hotel at the same price; shifted my luggage and ensured that the move was of minimal hassle to me. Hotel Royal Park was just 5 mins of walk away. What I liked about this hotel however was that it was at a slightly greater height and provided a better view of Gulmarg town. 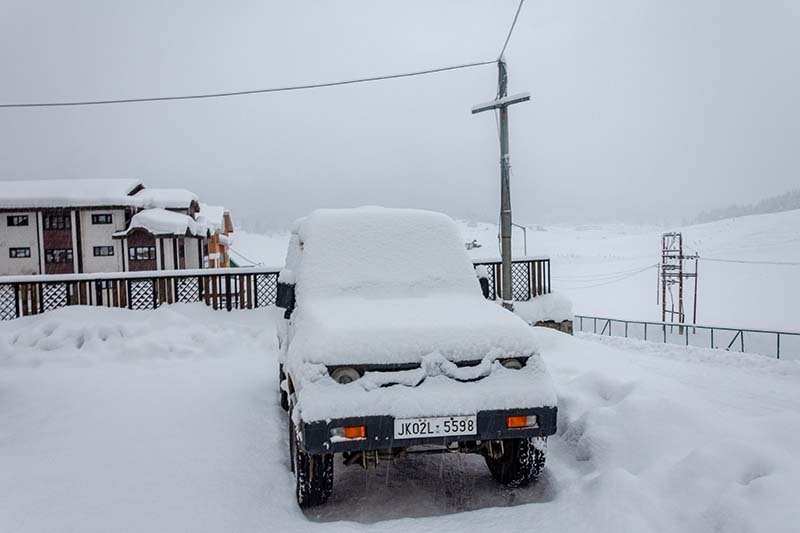 It continued to snow until noon and the intensity increased even more. Visibility too was quite low and there wasn’t much we could but to sit at our hotel and enjoy the view. Thankfully, the snowfall stopped at around noon. The sun was still playing hide and seek but the visibility improved tremendously. Bored of sitting at the hotel, we too came out for a walk. 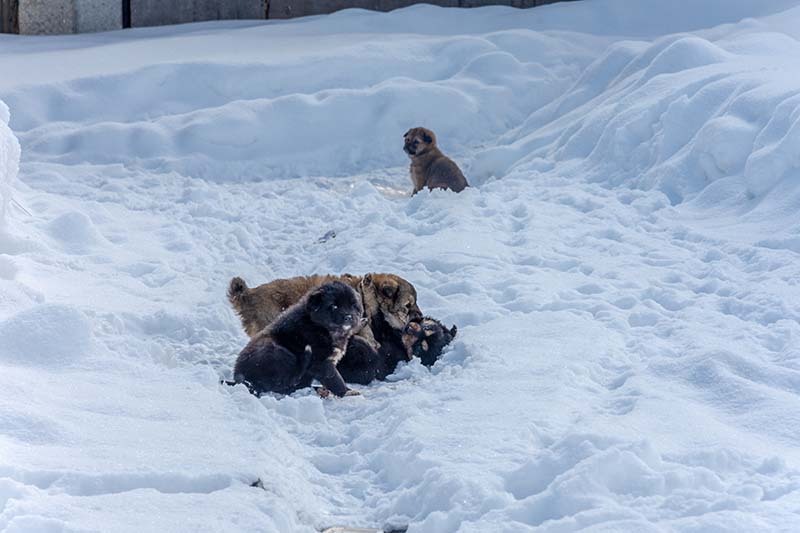 A few puppies playing around in snow. These little guys made me wonder how they could survive this kind of weather. They even slept in the snow itself. We roamed around for a couple of hours and had lunch at Sohail’s restaurant. Weather continued to remain dicey and then once again turned bad. It started to snow and visibility reduced to like below. All the walking around in the snow took a toll on my cousin’s shoes. I was wearing Provogue Boots and they served the purpose well. My cousin on the other hand was wearing normal Puma Sports shoes which did not last even 2 days there. Our original plan was to rent boots in Gulmarg but seeing that our shoes were doing fine until now, we chose to forget about renting boots. But on the third day, my cousin’s shoes could not take the snow and wet anymore and soles of both the shoes came off. It was just the sole that came off but rest of the shoe was fine. There was no shoe repair guy available in entire Gulmarg so we just had one choice. Buy a glue like Feviquick and make it work for next two days. We asked around at a few shops. Feviquick wasn’t available anywhere but we did find a similar glue called Elfy. We returned to our hotel and first task was to glue the soles of my cousin’s shoes back. Fortunately, it worked and we did manage to put the soles back in place. Once that done, we spent rest of the day mostly watching TV. It stopped snowing towards late afternoon again and we decided to build ourselves an ugly and scary snowman. And that pretty much all that happened on this particular day. We had dinner at the hotel itself, watched TV and went to sleep. By evening, it was snowing again and kept getting more intense by each passing hour. Tomorrow, we were going to check out of Royal Park and reach Srinagar by noon. My preferred hotel in Srinagar is always Grand Valley Inn and that is where we were going to stay this time as well. I called the owner to let him know that I will be arriving in Srinagar tomorrow. He on the turn told me that the hotel was closed due to renovation work but agreed to open one room for our stay. With that arrangement done, we both went back to sleep. 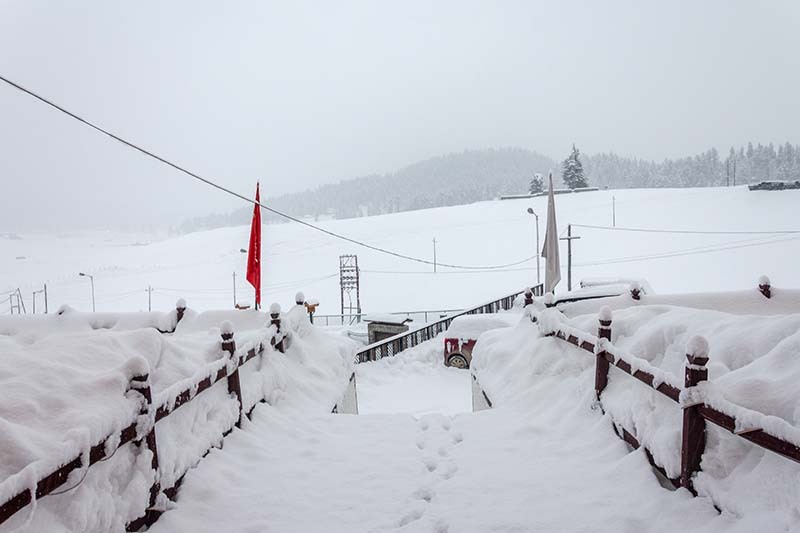 This was our last night in Gulmarg which kind of made me a little sad really. 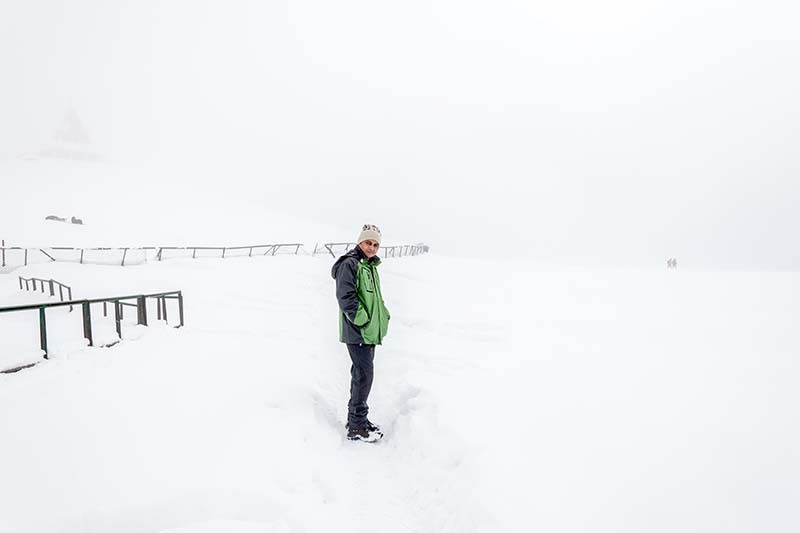 Even though we did not do much today and stayed indoors for most part of the day, I really hoped that we could stay for one more day and enjoy the snowy views. Little did I know that my wish was going to come true the next day.